My typical lunch in a bowl. It’s a vegetable soup today. Weather is finally cooling down now, perfect for making a nourishing soup! I like making salads too but my body is calling for a bowl of warm soup in this weather. 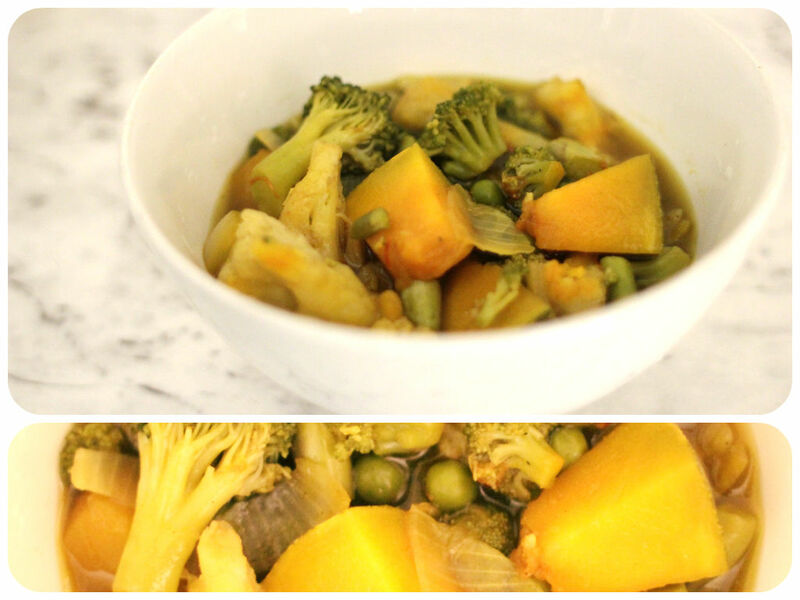 I threw in chopped onion, pumpkin, broccoli, cauliflower and peas into a pot. Bring it to boil and simmer for 15-20 minutes until cooked. I also added a pinch of saffron and a teaspoon of turmeric and cardamom into my soup to make it more nutritious and beautiful. Saffron is well known for a very expensive and amazing medicinal spice. It is full of antioxidants protecting you from oxidant-induced stress, cancers and infections. It is a good source of minerals and vitamins. Saffron has been traditionally used as anti-depressant, antiseptic, digestive and anti-convulsant. For ladies, it also has beauty benefits for beautiful radiant skin. You can buy either threads or powdered form at the spice markets, but ground saffron has a shorter shelf life. You need to keep them in a closed box and in a dark cool place away from the light. I like its distinctive flavour, aroma and beautiful colour, great both in savoury and sweet dishes. Add a pinch when cooking rice, risotto, pilaf, quinoa, or paella, making a soup, baking a cake, making a warm drink. It is very versatile and a pinch is enough for the full flavour and colour. I paid about 7 dollars for a 1g box. It is a bit expensive, but remember you use only a pinch for the entire recipe and it is so worth it!